Share this product and receive a $15.29 sharing discount. 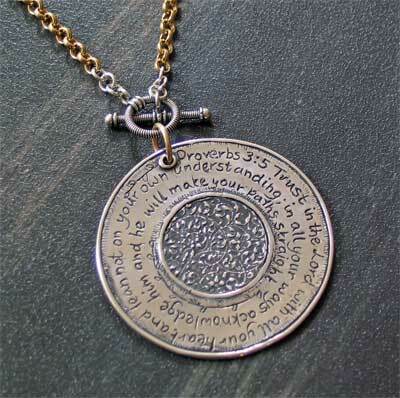 Words cannot really express the beauty of this handcasted scripture jewelry necklace. This stunning pendant is made from .925 sterling silver. 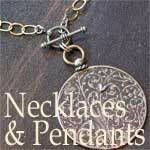 The flat medallion has a floral motif in the middle of the the side that has Proverbs 3:5 cast onto it. The other side has the scripture from Proverbs 16:9 cast into the middle and there is a floral motif along the outside. The medallion, itself, measures 2". The gold-fil 3.9mm large rolo chain has a lariot (front) closure and measures 18".